On the occasion of 8th March, RAWA held a function in which about 2 thousand people, mainly women and girls participated. The gathering was largely attended by war-affected Afghan women and men, who had left their motherland due to infighting and ill-treatment and brutalities of the fundamentalist forces. In addition to RAWA organizers and members, a large number of RAWA's supporters from refugee camps in Peshawar and from some cities of Pakistan and Afghanistan had also participated. While the women all over the world were celebrating this glorious day to highlight their achievements and their future vision, RAWA took the opportunity to mark the disastrous and horrible conditions the Afghan women are enduring since the religious tyrants of the Taliban and Jehadi type came to power. The walls of the hall, where the function held, were decorated by slogans and posters depicting the hatred of the Afghan people against the criminal fundamentalists, and their deep desire for freedom, democracy, social justice and women's rights. Photo exhibition illustrating the miserable life of the Afghan people were also caught the attention of the audience. Handicraft works of RAWA were also presented and a considerable part of them were sold. The literature of RAWA attracted the keen attention of many people and lots of them bought cassettes and different issues of "Payam-e-Zan". A member of RAWA began the function by reading the opening speech expressing the objectives of RAWA of holding of such functions despite its many financial and security problems and the threat it face from the Taliban and their fundamentalist brothers in Pakistan and Afghanistan. Part of the opening speech says that: "The celebration of the 8th of March should not be considered separate from the work of exposing the nature of the Islamic and non-Islamic fundamentalists. Because wherever there is the rotten stench of the fundamentalists, the oppression of women lies in the same sewer with it. We should all stand against the fundamentalists and not allow them to once again, through the misuse of the name of Islam, wound our people and in particular our ill-fated women. " 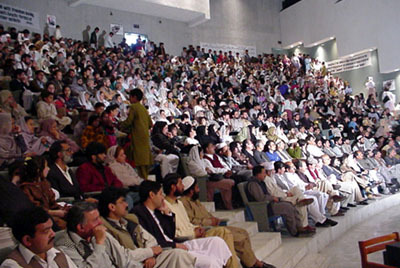 Noted Pakistani personalities and human rights activists including Asma Jahangir, the founding chairperson of the Human Rights Commission of Pakistan (HRCP), its sitting chairman Afrasyab Khatak, Tehrik-e- Istaqlal's chief Air Marshal (Retd) Mohammad Asghar Khan, Communist Mazdor Kissan Party chief Afzal Shah Khamosh and Qaisar Khan delivered their speeches. Asma Jahangir in her speech while expressing the solidarity of the Pakistan people especially the women with the Afghan people said, "We really feel that we Pakistani women in the past couple of years had forgotten the Afghan women and their sorrows… Until and unless the Afghan women enjoy freedom and their due rights, we Pakistani women will never see the real democracy. We are paying tribute to the long and hard struggle of Meena and our Afghan sisters. We sacrificed nothing, but you did…. We apologize that we left you alone in your struggle… "
While condemning the fundamentalists in any shade, she continued: "Slaughterer is slaughterer, whether he is a Talib or any other person". Describing the concept of fundamentalism she emphasized that " anyone who use Islam and religion to terrorize and create a state of fear and panic are fundamentalists"
At the end of her speech she explained that: "The destiny of our country is bound to the destiny of Afghanistan. The fundamentalism will strengthen and its root will spread as cancer…. I hope RAWA and its friends will be able next year to celebrate this day in Kabul and I wish we will be your host and you will be our guests." 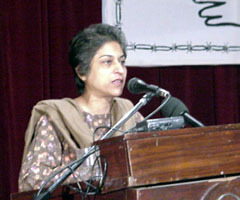 Asma Jehangir also announced that HRCP will observe the International Women's Day in 2001 in the name of Afghan women. Afrasyab Khatak, sitting chairman of HRCP said: "They (Jehadi and Taliban fundamentalists) killed the Afghans; destroyed the country; beaten the people and murdered the intellectuals, but still the Afghan people are there. I believe your determination will never die. People's determination is immortal." "Afghanistan has changed to a big prison. Why there is no end to arms supply? From where the money come from? During the Hindu-Pak war, ammunitions and arms of the both side finished in a couple of days. But here in Afghanistan, there is no end to arms and ammunitions. Pakistan, Iran, Russia and a number of other countries are interfering in Afghanistan," he added. Afzal Khamoush, chairman of the Communist Mazdoor Kissan Party, in his exciting and comprehensive speech asked for equal rights around the world for Muslims, Hindus, Christians and Jews both women and men alike. He also requested of all nations and societies in the world to put aside the differences created by the name of ethnic, religious and other sinister ideologies which are keeping the human being in war and far from each other. He added that as a result of uncertain situation of Afghanistan, unrest was increasing day by day in all over the region. Therefore, the regional countries should revise their negative policies towards Afghanistan. Tehrik-e-Istaqlal chief Asghar Khan in his address while expressing concern over blood-shed and destruction, reminded that since long they have been demanding a negotiated solution to the on-going conflict of Afghanistan. He alleged that beside other countries, Iran, Pakistan, Russian and Saudi Arabia are involved in naked interference in the affairs of Afghanistan. He assured RAWA of his party's whole-hearted support. Another speaker Qaisar Khan General Secretary Pakhtonkhwa Awami Party, while reiterating the points Asama Jahangir and Afrasyab Khatak mentioned, added that we should before everything else be Afghan and then Talib, Jehadi, Masoudi or Whadati. He added that general Zia and his friends destroyed Afghanistan, so now we want general Musharaf to solve the problem and change the Pakistan policy towards Afghanistan. Speakers of RAWA while expressing their sympathy with their sisters who are living in captivity of the fanatic groups in Afghanistan, blamed the international community and especially the UN for not playing active role to solve the Afghan crisis. They said that the problems in Afghanistan need action rather than discussion and talks. They continued that the UN instead of considering the views and wishes of the ordinary Afghan people for the solution of the Afghanistan problem, is paying much more consideration and attention to the wishes and plans of the warring factions who are the responsible of the 75 percent destruction of Afghanistan and the killing of tens of thousands of its people. The students of RAWA's schools presented patriotic songs in Dari, Pashtu and Urdu which were welcomed by the audience and our Pakistani guests. A number of foreigners also announced their support and deeply impressed by the patriotic songs and poems in which the brutalities of the fundamentalists and the aspiration of the Afghan people were embodied.  A poem by an American supporter of RAWA, Sue Silvermarie, "I Stand by Your Ear Unseen" also presented by her own voice through tape recorder and its Dari translation was read by a member of RAWA. At the end of the function a drama in three acts presented by RAWA's activists and school students which was highly appreciated by the audience. The drama showed the destiny of a family after the capture of Mazar city by the Taliban. Moreover, the interference of the foreign countries, especially Pakistan and Arabic countries in the internal affairs of Afghanistan and the crimes and mischief the Arab and Pakistani fundamentalists are committing inside Afghanistan, especially towards our bereaved women and young girls were very well described in the drama. It is worth mentioning that the function held by the financial help of RAWA's supporters, but still we owe about $US 12,000 which we have spent in transportation and accommodation charges of those who come from inside Afghanistan. A resolution was also distributed in English, Farsi and Pushto. The report of the function and interview with RAWA activists were broadcasted by Radio Voice of America and BBC Pushto and Persian services.